It’s always a happy surprise when new recipes turn out better than I’d expected. 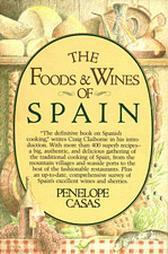 The above homey-looking dinner plate holds two excellent dishes from Penelope Casas’s Foods and Wines of Spain. 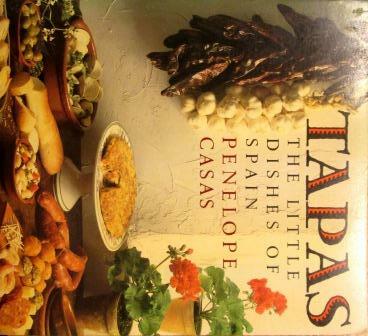 This is the book that first introduced me to Spanish cooking and the one I most often rely on. 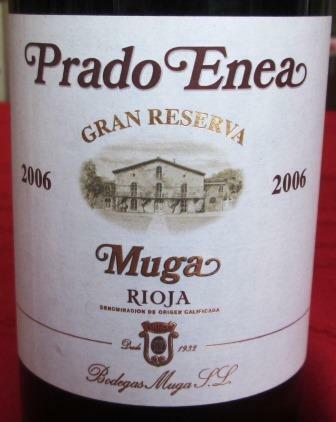 It has never let me down, and I still continue to discover good new things in it. 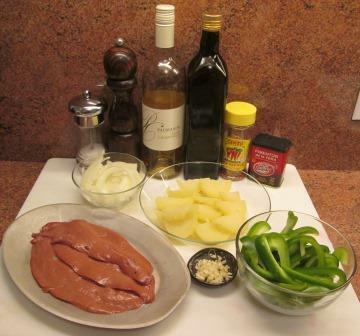 This time I was initially struck by a recipe called Higado con Pimientos, which had an uncommon pairing of calf’s liver and green peppers. 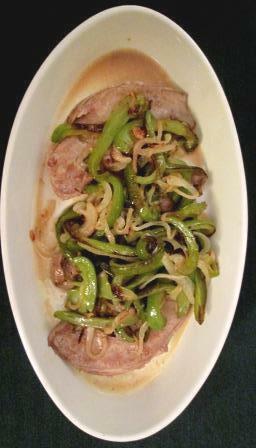 Liver and onions is a classic combination, but I’d never seen green peppers used in a dish with liver. 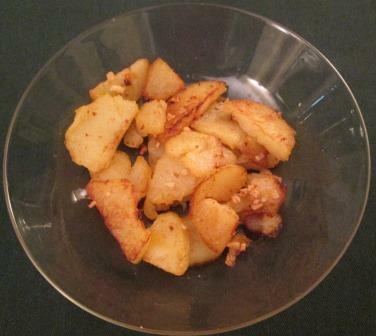 Casas also recommended a potato dish, Patatas Picantes, as an accompaniment. Curiosity led me to try them. 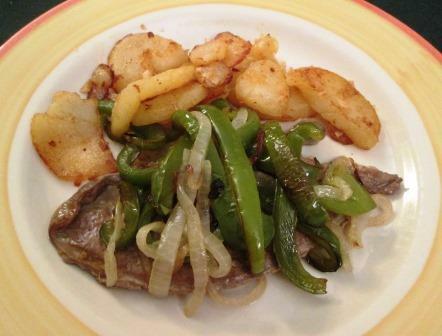 The ingredients for two portions of both recipes were easily assembled: liver, sliced Bell peppers, sliced onions, minced garlic, a potato parboiled and sliced, and a few condiments. 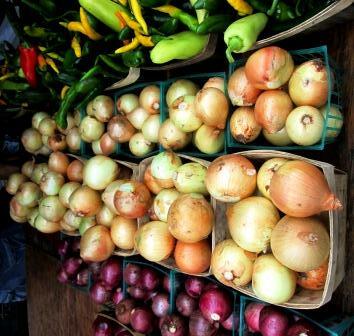 The first things to be cooked were the peppers and onions. 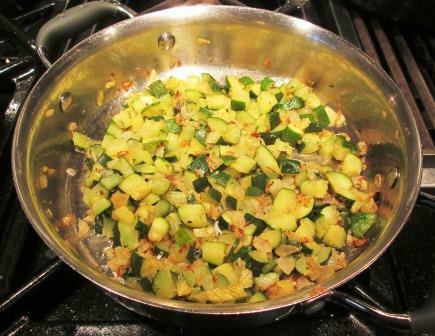 We have peppers and onions often, but I do them in the Italian manner, which is to say together in one pan. 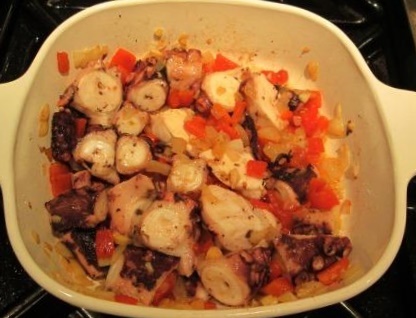 For this dish they were done separately: first the onions, sautéed in olive oil and removed to a dish; then the peppers, briefly sauteed in the same pan, then covered, fully cooked, and removed to the dish. 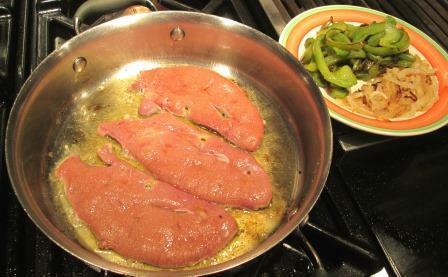 Finally the liver was quickly sauteed in the same pan, with a little more oil. 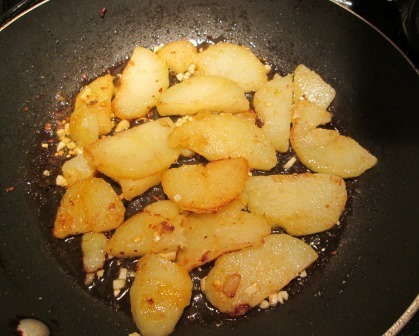 Meanwhile, I’d been also cooking the boiled, sliced potatoes – sauteeing them in a different pan until lightly browned and then stirring in minced garlic, crushed red pepper flakes, and pimentòn dulce (Spanish smoked paprika). 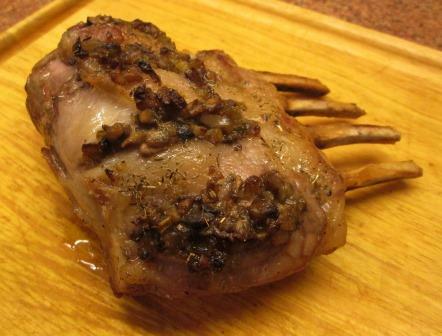 When the liver came out of its pan, I deglazed it with white wine, reduced the liquid, poured that over the liver, and put it in a serving dish in a turned-off oven to keep warm. The final step was to reheat the peppers and onions in their original pan, season them with salt and pepper, spread them over the liver, and serve. These were the simplest procedures, yet they had remarkably subtle effects. Sauteeing the onions and peppers separately, in the same oil, and then finishing them in the remnants of the liver oil and the deglazing sauce, made the vegetables quite different from Italian peppers and onions: they didn’t blend together but each stayed itself, with just overtones of the other components’ flavors. 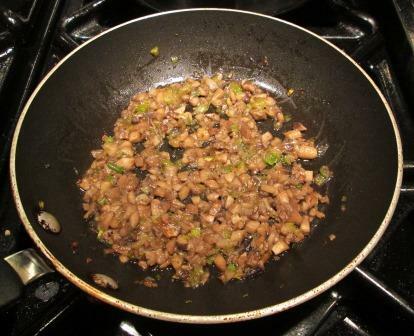 And the liver had taken on the same multi-flavor hints from the vegetables’ sauteeing oil and the deglazing sauce. 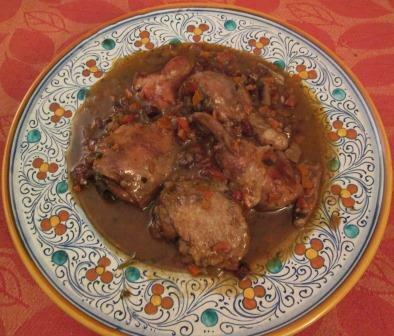 I was very happily surprised by how the peppers’ natural acidity made them a wonderful foil for the sweetness of calves’ liver and the onions. 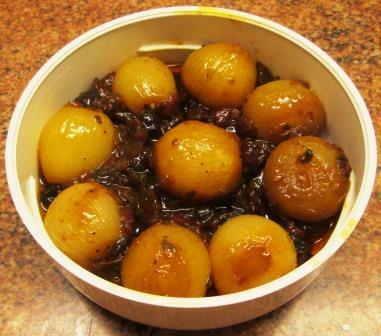 The potatoes – with crunchy edges and soft interiors – loved their zingy spices and made an excellent counterpoint to the gentle harmony of peppers, onions, and liver. 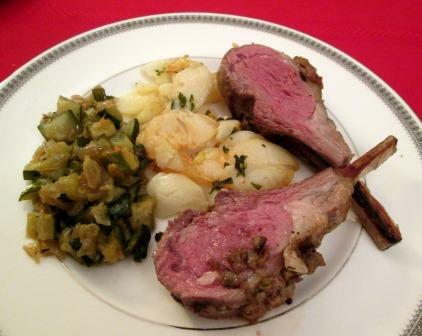 Altogether, a very interesting pair of dishes and a very enjoyable simple meal. 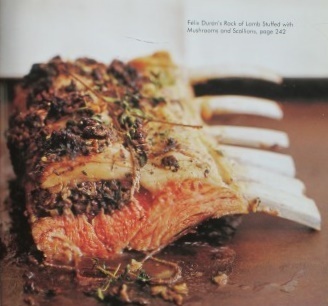 Eager to try making it at home, I began looking for recipes. 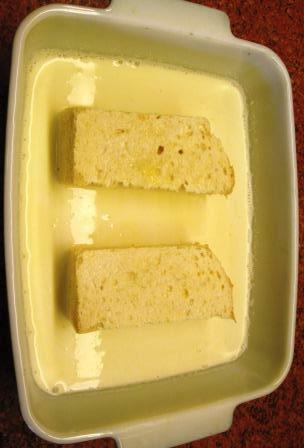 There were two in my Spanish cookbooks, and I found others on the internet, but they were all essentially French toast: bread slices dipped in a thin custard, some also in beaten egg, and fried to thorough brownness in oil or butter. 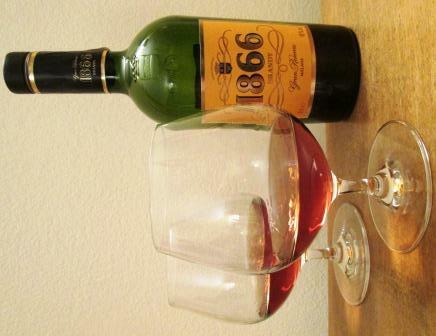 It was clear from my photo that the one I had in Spain hadn’t been done that way. The soft white sides of that torrija made me think it couldn’t have been fried at all, so when I attempted to recreate the dish I baked it and ran it under the broiler with a brown sugar topping. Never mind the details; it didn’t work. I never got around to trying again. But I couldn’t get that torrija out of my mind. Recently I had an idea about it: I searched for the name on Google Images. Among the hundreds of photos that came up, a few looked something like the one I had in Spain. 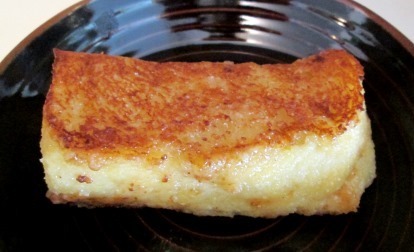 Pursuing those to their sources, I learned that there are two kinds of torrijas. “Mine” was the kind called caramelezada, and it’s cooked in a way different from the French-toast type. Eureka! 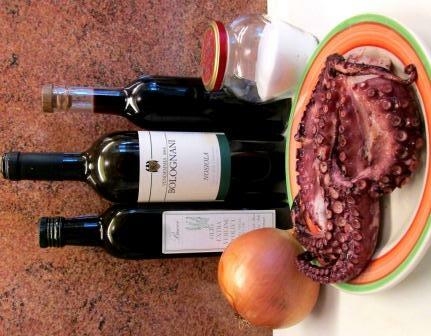 But not so fast: the underlying recipes were all in Spanish. The little of that language that I know wasn’t enough to fully grasp the techniques, and Google’s translations were ludicrous. So I had to improvise somewhat. 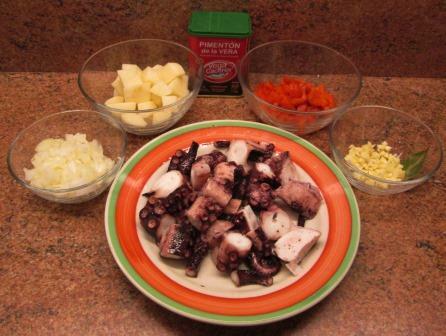 Here, by the way, is the recipe I relied on, to the extent that I could, for my experiment. Making just a fraction of the recipe’s quantities, I stirred together milk, heavy cream, beaten egg and sugar. I put two thick slabs of my own white bread into this uncooked batter and left them to absorb it, which turned out not to be as simple as it sounds. The recipe said they’d need 45 minutes on each side. That seemed like a lot, but fortunately I’d started early enough in the day, because it did take that long, even with occasional pour-overs to expedite the process. We go with the marking of the French toast. We light the pan with butter. We pour plenty of sugar on the top and put them in the pan for a while until the sugar is roasted (but be careful not to burn). 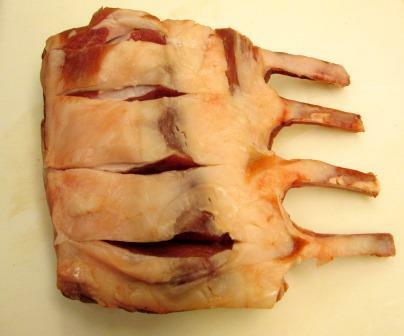 We do the same for the other side and put them on the plates. Was I supposed to put the sugar on top of the butter, which was just referred to, or on “them,” the breads? How much sugar is “plenty”? It would also have helped to know how high a heat to use and how long it might take for the sugar to “roast.” ¿Quién sabe? First I tried putting the sugar in the pan and laying the bread slice on top of the sugar. The butter bubbled along merrily, but when I tilted up the bread to see how it was browning, I couldn’t see any effect from the sugar. So just before turning the bread, I put some sugar on top of it. The butter was getting pretty dark, and I worried that it, not the sugar, might burn. 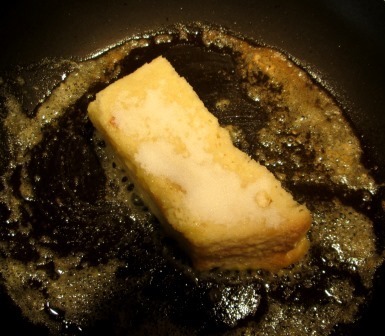 When the first chunk of bread was well browned, I took it out of the pan. No sugar had caramelized on it, but it was clearly cooked enough. 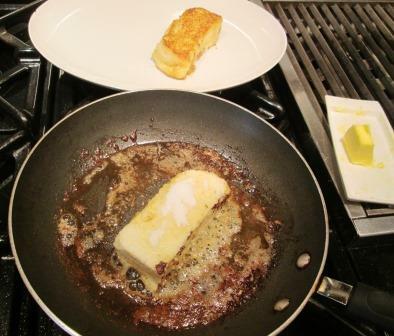 For the second chunk, I added more fresh butter and put sugar both in the pan and on each side of the bread. I got basically the same result: The sugar just dissolved, and the bread simply browned in the sweetened butter. I gave up and called them done. They weren’t a disaster. Their texture and flavor were very like the torrija I had in Spain. But I’m really sorry I couldn’t get the crunchy topping. Not just for the pleasant mouthfeel: Caramelizing sugar cuts some of its sweetness, and the amounts of sugar each torrija absorbed in my futile attempts to caramelize it gave it a far more intense sweetness than I’d have liked. A little blowtorch would probably have done the job, but I don’t own one. Beloved Spouse is voting for a few minutes under the broiler, but that didn’t work when I made my first torrija try. If anyone who reads this post has had success with torrijas caramelezadas, I’d be grateful for any tips you’d care to provide. 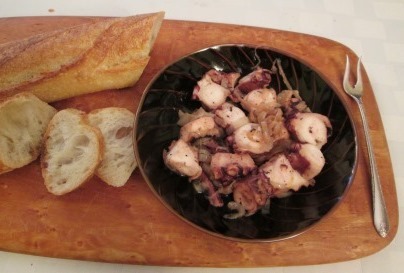 In English, please: My Spanish is clearly inadequate for this dish. Last week I went a little crazy at Miloski’s, the Long Island poultry farm we love. We’d driven out east 75 miles just to buy chickens. The trip itself was not unusual; we make it a few times a year, because they’re the best chickens we’ve ever had, even compared to all the free-range kinds available in Manhattan. We often make a day of it, pushing further out on the North Fork and adding farmstand and/or winery visits, even a little birdwatching. But this time we went just for chickens – straight out and straight back. What we came back with is 18 pounds of poultry: 2 whole chickens, 10 very large chicken legs, and 4 duck legs. Even for me that’s excessive, but somehow they all called out to me. 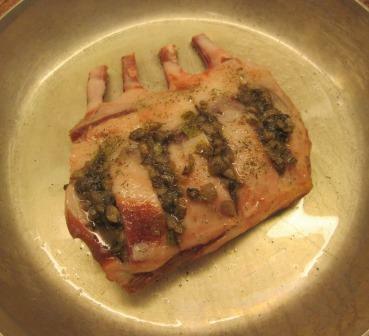 So now our freezer is full of fowl, and I’ve started happily working my way through it. 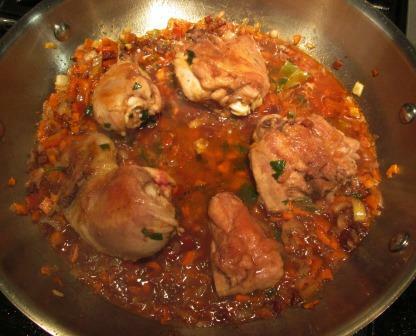 Most recently I took out two of the big chicken legs and made Pollo al Vino Tinto, from Penelope Casas’s The Foods and Wines of Spain. 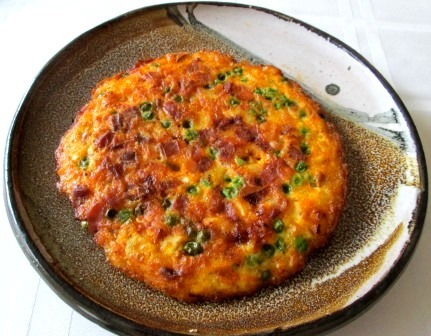 I’ve made the recipe before and like it very much. Even Beloved Spouse – the irredeemable non-chicken-fancier – likes it, which helps ensure domestic tranquility. 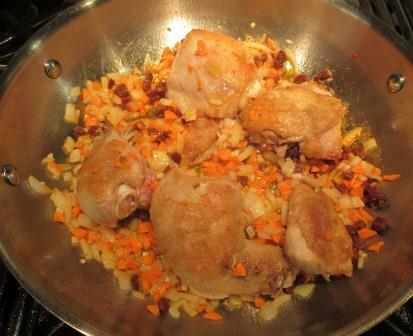 I floured and browned my chicken pieces, then stirred in a mince of carrot, onion, garlic, and chorizo. Imported Spanish chorizo, I feel, is crucial to this dish. 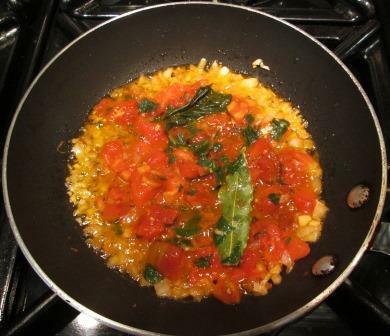 Next into the pan went a chopped roasted red Bell pepper – which I’ve found a reasonable substitute for a pimiento – salt, pepper, bay leaf, thyme, chicken broth, and red wine. 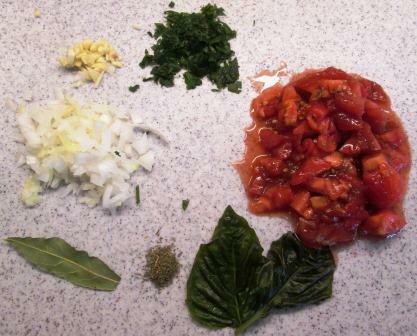 Then it was just to stir, cover, and simmer until the dish was done. Casas says it takes 1½ hours, but I’ve found an hour to be fine, with the cover off toward the end to reduce the sauce a little. 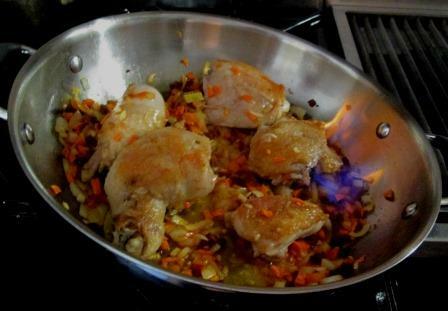 Initially I wondered if I ought to puree that rough-looking sauce, but we actually liked the effect of the tiny nuggets of chorizo and vegetables in the same bites as the soft, tender chicken. 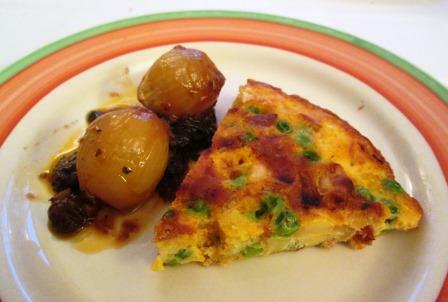 The smoky, pimentòn spiciness of a good dry-cured chorizo gives an unmistakably Spanish lilt to this hearty, rustic dish. 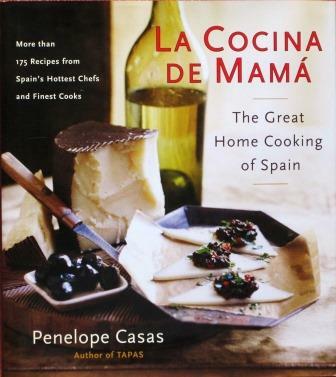 I’d found a recipe to make with them in Penelope Casas’s cookbook La Cocina di Mama: The Great Home Cooking of Spain. I’ve had several good results from this book, as well as from other books by this author. I’ve already written about a few of them here, here, and here. 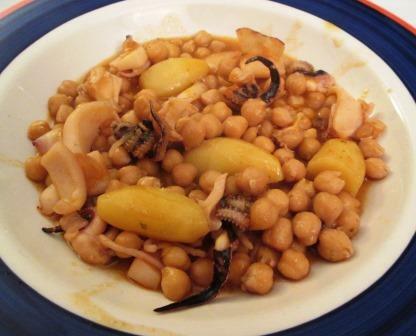 The recipe I chose this time, Potage de Garbanzos y Chocos, is a spicy stew of cuttlefish, chickpeas, and potatoes. At first reading, I thought the ingredient list was awfully heavy on the chickpea component, given the way dried legumes swell when reconstituted: To serve four, it called for a whole pound of dried chickpeas, as well as a pound of chocos. But I trust Casas, and I had some good heirloom chickpeas from Italy, so for the half recipe I was making I used the full half pound. Soaked overnight in water, the chickpeas duly grew to three times their dried volume. 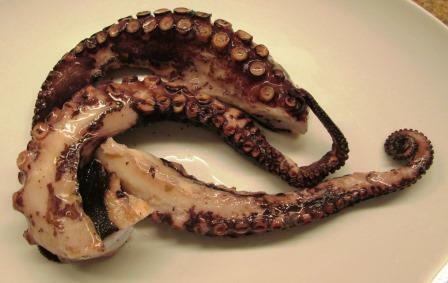 Undaunted, I put them in a big pot with water, half a head of unpeeled garlic, olive oil, a small chopped tomato, parsley, a bay leaf, a small dried hot red pepper, and half a teaspoon of pimentón dulce (Spanish smoked sweet paprika). All this simmered for a little over an hour, producing enticing aromas that wafted out of the kitchen and scented half the apartment. When the chickpeas were beginning to soften, I moved on to the next step: adding the choco – neatly cut into short strips by my obliging knifeman – and a few fingerling potatoes. After another half hour, everything was tender. 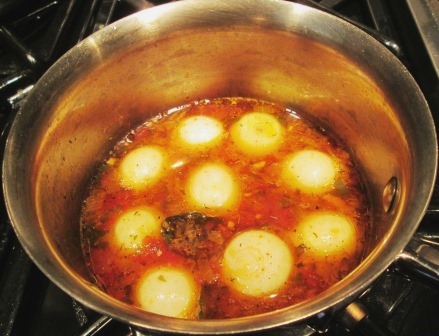 To finish the dish, I squeezed the garlic flesh into the stew and discarded the skin, stirred in another dose of pimentón, and let the pot sit covered for 15 minutes before serving. 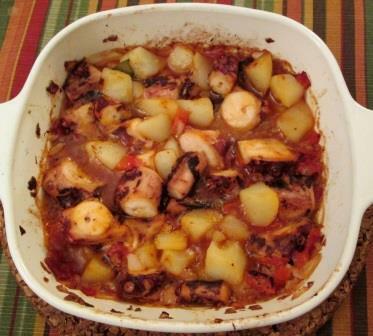 It was a marvelous dish – everything worked together beautifully, and the taste fully justified the cooking aromas. 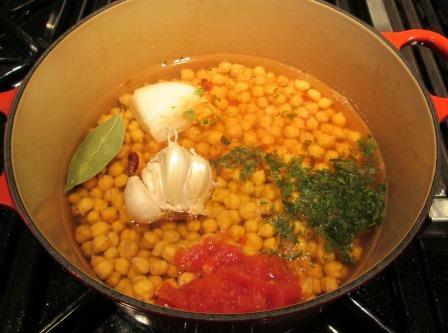 The chickpeas had taken on good spicy flavors in addition to their own basic nuttiness. In fact, we couldn’t finish them all, but we got through more than I expected to. 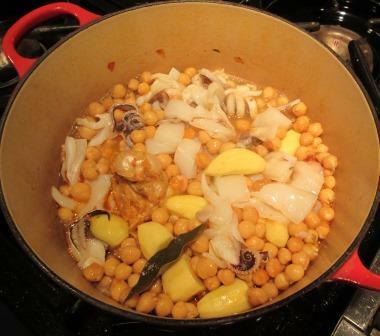 There was about a pint of leftovers, mostly chickpeas, which I carefully saved to use another day. 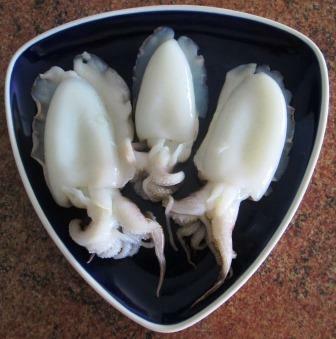 Thoroughly enjoyable as the cuttlefish were, I’d had a slightly uneasy feeling all during dinner, which I later decided was an overactive imagination responding to the splendidly lifelike Venetian glass cuttlefish that have looked over our shoulders for every meal we’ve eaten in this apartment. 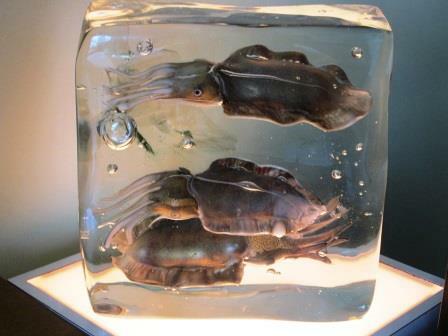 I couldn’t say for certain that they recognized their Spanish relatives, but the whole cephalopod family is highly intelligent.